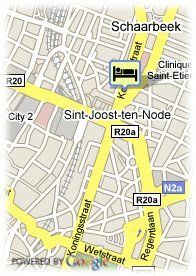 You are here: Home - Hotels in Brussels - Hotel BLOOM! Rue Royale 250, 1210 Brussels, Belgium. Imagine a stay that is breathtakingly simple. A central hotel where you can breathe, stretch your arms and enjoy everything Brussels has to offer. Imagine Hotel BLOOM! 305 airy, light-filled rooms in a choice of nine categories. From the moment you stroll in to the moment we wave goodbye, everything is light and cheerful. Then step outside and discover the location, just minutes from the centre with easy connections to the major road and rail networks. The trams and metro just outside our door to whisk you up- or downtown to see the sights or taste Brussels' renowned restaurants. Stay away from the ordinary. Stay at Hotel BLOOM!. Near exhibion centre, Near trainstation, Park, Near to the university, Centre, Museum Area, Near highway, Near the historic centre, Near airport, Near subway / tramstation, Near shopping centre. Food & Beverage in Hotel BLOOM! 'SmoodS - Living room, kitchen and music' is all about freedom and music! Relax and enjoy the food that matches your mood in any order, size and quantity you wish. Area information of Hotel BLOOM!